Vintage - Paragon Fine Bone China, 5-Pieces of Tea Set, "Red Rose" Pattern C57, Circa 1957-1963. 2-Cups, 1-Saucer, and 2-Tea Plates of the Paragon Fine Bone China "Red Rose" Pattern #C57, which has a Beautiful Single Red Rose as the Focal Point. This is a Lovely Scalloped White Bone China, with Rims Decorated in 22kt Gold Scrolls, Lattice and Flowers, along with the single Bold Red Rose. Rims on all items are in 22kt Gold, as are the Feet and Handles of the Cups, Creamer and Sugar Bowl. This is an extremely hard to find Mid-20th Century Pattern... Very Delicate and Romantic - Pictures may include additional pieces, but Price is for only the 5-Pieces noted above and below. Very Good Resale Condition. 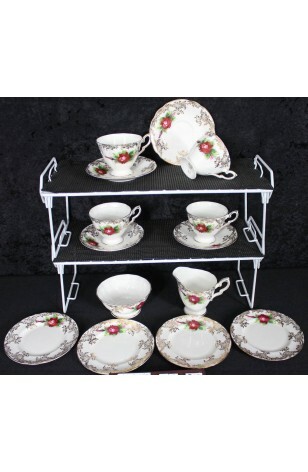 Check our other Inventory as well, for a 14-Piece Tea Set. Vintage - Paragon Fine Bone China, 5-Pieces of Tea Set only, "Red Rose" Pattern C57, Circa 1957-1963. 2-Cups, 1-Saucer, and 2-Tea Plates of the Paragon Fine Bone China "Red Rose" Pattern #C57, which has a Beautiful Single Red Rose as the Focal Point. This is a Lovely Scalloped White Bone China, with Rims Decorated in 22kt Gold Scrolls, Lattice and Flowers, along with the single Bold Red Rose. Rims on all items are in 22kt Gold, as are the Feet and Handles of the Cups, Creamer and Sugar Bowl. This is an extremely hard to find Mid-20th Century Pattern... Very Delicate and Romantic - Pictures may include additional pieces, but Price is for only the 5-Pieces noted above and below. See Item Nbr TS98 for additional items. Very Good Resale Condition unless noted below or in pictures. Check our other Inventory as well, for a 14-Piece Tea Set. 2 - Tea Plates - 6 1/4"